We found 244 results matching your criteria. This aftercooler used an air-cooled mechanism for cooling the discharge from an air compressor. They are an effective means of removing moisture from compressed air. This aftercooler controls the amount of water vapor in a compressed air system by condensing the water vapor into liquid form. Liquid water can cause significant damage to the equipment that uses compressed air. An aftercooler is necessary to ensure the proper functionality of pneumatic or air handling devices. This aftercooler used an air-cooled mechanism for cooling the discharge from an air compressor. They are an effective means of removing moisture from compressed air. This aftercooler controls the amount of water vapor in a compressed air system by condensing the water vapor into liquid form. Liquid water can cause significant damage to the equipment that uses compressed air. An aftercooler is necessary to ensure the proper functionality of pneumatic or air handling devices. Universal Coupler, Size 3/4 Inch, Coupling Description Hose End, Plated Malleable Iron, Air Service Only. Used to Connect air lines from Compressors or other air sources to all types of pneumatic tools and equipment Universal Coupler, Size 1 Inch, Coupling Description Hose End, Plated Malleable Iron, Air Service Only. Used to Connect air lines from Compressors or other air sources to all types of pneumatic tools and equipment Universal Air Hose Couplings Male End, 1/4" Size. Used to connect air lines from compressors or other air source to all types of pneumatic tools and equipment. Male and Female threads are NPT. Malleable iron plated. Note Safety Clips Not Included. Universal Air Hose Couplings Male End, 3/8" Size. Used to connect air lines from compressors or other air source to all types of pneumatic tools and equipment. Male and Female threads are NPT. Malleable iron plated. Note Safety Clips Not Included. Universal Air Hose Couplings Male End, 1/2" Size. Used to connect air lines from compressors or other air source to all types of pneumatic tools and equipment. Male and Female threads are NPT. Malleable iron plated. Note Safety Clips Not Included. Universal Air Hose Couplings Male End, 3/4" Size. Used to connect air lines from compressors or other air source to all types of pneumatic tools and equipment. Male and Female threads are NPT. Malleable iron plated. Note Safety Clips Not Included. Blastline ME-100 Universal Air Hose Couplings Male End, 1" Size Blastline FE-25 Universal Air Coupling, Female End, Size: 1/4" Blastline FE-38 Universal Air Coupling, Female End, Size: 3/8"
Universal Air Hose Couplings Male End, 1" Size. Used to connect air lines from compressors or other air source to all types of pneumatic tools and equipment. Male and Female threads are NPT. Malleable iron plated. Note Safety Clips Not Included. Blastline 06BFE025 Universal Air Coupling, Female End, Size: 1/4". Used to connect air lines from compressors or other air source to all types of pneumatic tools and equipment. Male and Female threads are NPT. Malleable iron plated. Note Safety Clips Note Included. Blastline 06BFE038 Universal Air Coupling, Female End, Size: 3/8". Used to connect air lines from compressors or other air source to all types of pneumatic tools and equipment. Male and Female threads are NPT. Malleable iron plated. Note Safety Clips Not Included. Blastline FE-50 Universal Air Coupling, Female End, Size: 1/2" Blastline FE-75 Universal Air Coupling, Female End, Size: 3/4" Blastline FE-100 Universal Air Coupling, Female End, Size: 1"
Blastline 06BFE050 Universal Air Coupling, Female End, Size: 1/2". Used to connect air lines from compressors or other air source to all types of pneumatic tools and equipment. Male and Female threads are NPT. Malleable iron plated. Note Safety Clips Not Included. Blastline 06BFE075 Universal Air Coupling, Female End, Size: 3/4". Used to connect air lines from compressors or other air source to all types of pneumatic tools and equipment. Male and Female threads are NPT. Malleable iron plated. Note Safety Clips Not Included. Blastline 06BFE100 Universal Air Coupling, Female End, Size: 1". Used to connect air lines from compressors or other air source to all types of pneumatic tools and equipment. Male and Female threads are NPT. Malleable iron plated. Note Safety Clips Not Included. Triple End Coupler, Plated Malleable Iron, Air King Universal, Air Service Only. Uses 3 Sets of 2 Lug Connectors to provide an extra outlet from one air source. Universal Coupler, Coupling Description Blank End, Plated Malleable Iron, Air Service Only. Fits 2 lug head on Universal Couplings to block line. Hole in flat portion allows for securing dead end when not in use. Blastline 06BHE125 Universal 1-1/4" Air Coupling, 4 Lug. Used to connect air lines from compressors or other air sources to all types of pneumatic tools and equipment. Help to prevent hose whip if couplings or clamp devices accidentally separate. Max. working pressure: 200 psi for air only. Safety Cable, Cable Diameter 1/8 Inch, Hose Inside Diameter 1/2-1 1/4 Inches, Length 20 1/4 Inches, Hose to Hose Service High-Torque Malleable Iron Bolt Hose Clamp Double Bolt W/Saddles, 3-1/2" to 3-11/16" OD Clamp Dia. Malleable Plated Iron. Reusable, these clamps provide an efficient means of securing couplings. As bolts are tightened, the double tongue saddles fill the gap between the bolt lugs preventing pinching of the hose OD. Fully Tightened, the double bolt clamps secure the full circumference of the hose. A rugged, plated iron two-bolt clamp with machine bolts and hex nuts. High-Torque Malleable Iron Bolt Hose Clamp Double Bolt W/Saddles, 3-1/2" to 4" OD Clamp Dia. Malleable Plated Iron. Reusable, these clamps provide an efficient means of securing couplings. As bolts are tightened, the double tongue saddles fill the gap between the bolt lugs preventing pinching of the hose OD. Fully Tightened, the double bolt clamps secure the full circumference of the hose. A rugged, plated iron two-bolt clamp with machine bolts and hex nuts. High-Torque Malleable Iron Bolt Hose Clamp Double Bolt W/Saddles, 4-1/6" to 4-7/16" OD Clamp Dia. Malleable Plated Iron. Reusable, these clamps provide an efficient means of securing couplings. As bolts are tightened, the double tongue saddles fill the gap between the bolt lugs preventing pinching of the hose OD. Fully Tightened, the double bolt clamps secure the full circumference of the hose. A rugged, plated iron two-bolt clamp with machine bolts and hex nuts. High-Torque Malleable Iron Bolt Hose Clamp Double Bolt W/Saddles, 4-3/16" to 5" OD Clamp Dia. Malleable Plated Iron. 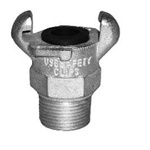 Reusable, these clamps provide an efficient means of securing couplings. As bolts are tightened, the double tongue saddles fill the gap between the bolt lugs preventing pinching of the hose OD. Fully Tightened, the double bolt clamps secure the full circumference of the hose. A rugged, plated iron two-bolt clamp with machine bolts and hex nuts. High-Torque Malleable Iron Bolt Hose Clamp Double Bolt W/Saddles, 5" to 5-1/2" OD Clamp Dia. Malleable Plated Iron. Reusable, these clamps provide an efficient means of securing couplings. As bolts are tightened, the double tongue saddles fill the gap between the bolt lugs preventing pinching of the hose OD. Fully Tightened, the double bolt clamps secure the full circumference of the hose. A rugged, plated iron two-bolt clamp with machine bolts and hex nuts.